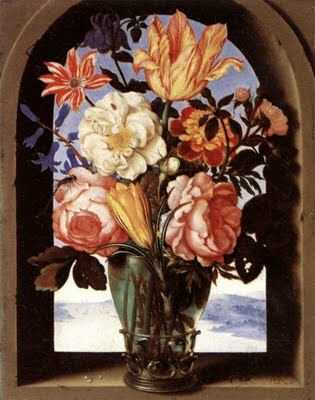 Flower paintings, Ambrosius Bosschaert (1573-1621) a Flemish-dutch painter. Note: a Pila sp. shell is situated at the right corner. So the fiddling with the frame and a reverse flower thing has spurred me to look at Ambrosius Bosschaert's paintings of flowers and bugs and the promise of the season that these blown out florals make. I am liking making these borders and need something for them to border or better, once on track, have the borders match the subject and vice versa. But for now, I am amused, researching and not too serious about anything illustrative. Bosschaert's paintings are simple compositionally, simple forms and yet they speak to me of lush summers and springs, the wealth of nature and for the dutch, the wealth generated by their trade in tulip bulbs. So, that said, have that plate and interest spinning. Fraktur is both a style of lettering and a highly artistic and elaborate illuminated folk art created by the Pennsylvania Dutch (also known as Pennsylvania Deitsch or Pennsylvanian German). Most Fraktur were created between 1740 and 1860. Fraktur drawings were executed in ink and/or watercolors and are found in a wide variety of forms: the Vorschriften (writing samples), the Taufscheine (birth and baptismal certificates), marriage and house blessings, book plates, and floral and figurative scenes. The earlier Fraktur were executed entirely by hand, while printed text became increasingly common in later examples. Common artistic motifs in Fraktur include birds, hearts, and tulips, as well as blackletter and italic calligraphy. Today, many major American museums, including the Metropolitan Museum of Art and the Philadelphia Museum of Art have Fraktur in their collection. Important Fraktur have been sold by major American auction houses and antique dealers for prices in excess of $100,000. The definitive text on Fraktur is widely considered to be The Fraktur-Writings or Illuminated Manuscripts of the Pennsylvania Germans, written by Dr. Donald A. Shelley and published by the Pennsylvania German Society in 1961. In late 2004, part of Dr. Shelley's Fraktur collection was sold at public auction in Pennsylvania for $897,833. Interesting time period, no? Sort of overlying the early American gravemarkers you all know I love--spanning through the writings of Jane Austen and like writers, through the civil war. So, its pre Victorian and then at the end promises that time. However, on the early side, this is similar imagery to that of the early funerary art. There is a great website Fraktur Web that explores the known Fraktur illustrators and shows how one informed or taught the other in this very limited geographical area. Additionally, this site details the types of Fraktur work that was created. Simply put, Fraktur had a use and a place to note and commemorate things in people's lives. Fraktur was used to embellish/design / detail hymnals, bookplates (for awards of merit); religious broadsides, house blessings (Haus-segen) and purely pictorial works all received the fraktur treatment. As early as 1772, the Ephrata Cloister brother and sister calligraphers were turning out the “Goldene ABC,” an inspirational work. Iluminated birth and baptismal certificates are the most numerous fraktur (Taufschein Fraktur). The other, Vorschrift fraktur were "best examples certainly are the most inspired marriage of writing and illumination within this art form. The fraktur Vorschrift is a model for writing exercises often drawn by schoolteachers and particularly popular among Mennonites and Schwenkfelders. Consisting of Biblical verses or hymns, they were used in the parochial schools that pre-dated the founding". These symmetrical illustrations fascinate me as they are part of a culture of a small group of people, illustrated by known calligraphic illustrators or illustrative calligraphers..creating pieces that were noteworthy as images but that were significant in recognizing life's progression and the recognition of those key moments in a graphic way. When I was younger, my mother had found these printed marriage certificates that were rendered in a fraktur manner that she would have me ink in the names in blackletter to match the spirit of the certificate. I am thinking that there may be a place to develop some illustrative marriage and birth certificates in the same manner for sale of my own work (inspired by the Pennsylvania Germans or by any other whimsical birth or marriage images that strike me). These could be letterpressed into rich, all cotton paper and packaged in a beautiful way. This is a saleable idea...and will allow me to explore this form with a few goals in place. Today--more pushing of the teenagers. More work and a guest arriving for a two night stay. Alex is love/hating the preseason crosscountry, but there is talk he may be a varsity runner. We got everyone's schedules worked out with Alex getting a roster of great teachers and his two top picks--guitar lessons and Music Theory. We swapped out 2 of the four AP classes for better/more engaged teachers for Kitty--with English being public speaking and Shakespeare...and the government class taught by a spitfire who has opinions and isnt afraid of dragging his class into conversations. It feels like this is all very positive.